SNOOZE HAPPY - Drifting off to sleep is a breeze when your child is snuggled up in Wildkin's Original Sleeping Bag. Each Sleeping Bag measures 66 x 1.5 x 30 inches and is perfectly sized for keeping your little one cozy. Between its eye-catching patterns and super comfy design, your little one won't want to sleep without their new favorite Sleeping Bag. SUPER SOFT - The exterior of Wildkin's Original Sleeping Bag is made from a super soft blend of cotton and polyester materials. The interior is lined with 100% cotton flannel to keep your little one extra warm. Whether they're cuddled up at their friend's house for a slumber party or hunkered down in the living room for a blanket-fort campout, this Sleeping Bag is sure to keep your child ultra-comfy. TRAVEL-FRIENDLY DESIGN - Sleep can happen anywhere with Wildkin's Original Sleeping Bag! 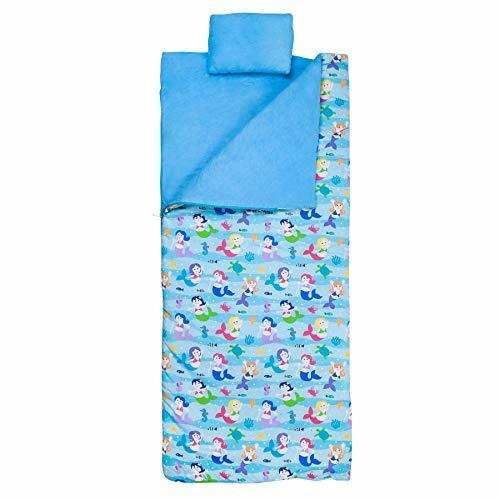 Each Nap Mat features a roll-up design, complete with elastic storage straps, matching travel pillow, and a coordinating drawstring-close storage bag. Its travel-friendly design makes it easy for your little one to take their Sleeping Bag with them to-and-from sleepovers, grandma's house, and more. VIBRANT COLORS THAT LAST - Accidents happen, which is why we made our Original Sleeping Bag easy to clean so your child can get back to snoozing! Just place your Sleeping Bag in a front-loading washer in cold water on a gentle cycle and hang to dry. Our vibrant colors were made to last, so you don't have to worry that they'll fade after washing. COORDINATES WITH OTHER WILDKIN GEAR - Make a theme out of it! Each Sleeping Bag was designed to coordinate with other Wildkin gear. From lunch boxes, to duffel bags, to backpacks, your child will love having their favorite designs with them on-the-go. Wildkin Kids Sleeping Bags are perfect for sleepovers and living room camp-sites making bedtime more fun and less a chore. Designed for toddlers age 3+ to kids up to 5 feet tall -- your child will stay cozy, happy and feel like a real trend setter with all the great kid-friendly patterns to choose from. Naturally flame-resistant; Wildkin Kids Sleeping Bags bags are never treated with nasty flame-retardant chemicals. They're also rigorously tested to ensure that all parts are lead-free, bpa-free, phthalate-free, and conform to all rules and regulations set forth by the Consumer Products Safety Information Act. Conforms to U.S. flammability test requirements for sleeping bags as set forth in CPAI-75. Drifting off to sleep is a breeze when your child is snuggled up in Wildkin’s Original Sleeping Bag. Each Sleeping Bag measures 66 x 1.5 x 30 inches and is perfectly sized for keeping your little one cozy. The exterior of Wildkin’s Original Sleeping Bag is made from a super soft blend of cotton and polyester materials. The interior is lined with 100% cotton flannel to keep your little one extra warm. Each Nap Mat features a roll-up design, complete with elastic storage straps, matching travel pillow, and a coordinating drawstring-close storage bag. Its travel-friendly design makes it easy for your little one to take their Sleeping Bag with them to-and-from sleepovers, grandma’s house, and more. Each Sleeping Bag was designed to coordinate with other Wildkin gear. From lunch boxes, to duffel bags, to backpacks, your child will love having their favorite designs with them on-the-go. Wash in commercial front-loading machine in cold water on gentle cycle. Hang to dry. Do not store unless dry. 90-day manufacturer's warranty against defects - normal wear-and-tear, and misuse excluded. Rigorously tested to ensure that all parts are lead-safe, bpa-free, phthalate-free, and conform to all rules and regulations set forth by the Consumer Products Safety Commission. Not intended for outdoor use.